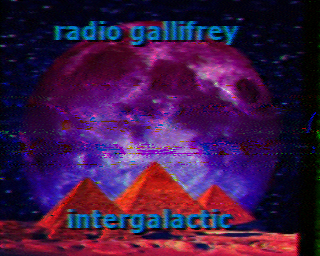 Last night, after returning from nearly two weeks of travel, I recorded pirate station, Radio Gallifrey Intergalactic. It was great to hear their strong USB signal on the air. RGI appeared on 6,930 kHz USB around 2:45 UTC (or so) and started their broadcast with a set of audio sweeps and then straight into the Dr. Who theme. At the end of the broadcast, I captured RGI‘s SSTV QSL via the CQ SSTV iOS app. This entry was posted in Music, Pirate Radio, Recordings, Shortwave Radio and tagged Dr. Who, Pirate Radio, Pirate Radio Recordings, Radio Gallifrey Intergalactic, Shortwave Pirates on March 22, 2014 by Thomas. I’m enjoying your recording. Thanks for posting. Pleasure is all mine, Stephen. I love pirate radio. Glad you’re enjoying it!